Whitehead Institute researchers have determined how the master transcriptional regulator of the heat shock response, known as heat shock factor 1 (HSF1), is activated and controlled. This insight could lead to treatments for cancer (where HSF1's activity is frequently hijacked) and neurodegenerative diseases (where its decreased activity may lead to the build-up of protein aggregates). "HSF1 is a crucial regulator of fundamental processes in cells that has the capacity to be used for both good and exploited for evil," says Whitehead Fellow David Pincus. "Our work has uncovered a fundamental, basic mechanism that controls HSF1, and it's a much simpler view of how this core regulator works." When cells undergo heat and other environmental stresses, HSF1 activates certain genes that produce chaperones, also known as heat shock proteins (HSPs). HSPs maintain the conformation, or "fold", of other proteins within the cell under conditions that would normally cause those proteins to lose their shape and ability to function. While HSF1 plays an important role in normal cells, it also has significant effects in cancer and neurodegenerative diseases. Many cancer cells hijack HSF1's activity to support their extremely high rate of protein production, to help them survive the hostile environments found in tumors, and to enable cancer to spread around the body. In neurodegenerative diseases, impaired HSF1 function may allow proteins to assume incorrect conformations and clump together into aggregates. Fine-tuning HSF1's activity in specific cell types could lead to treatments for both cancer and neurodegenerative diseases. Although HSF1 has long been of interest for therapeutic reasons, little is known about its activation or control. Scientists have hypothesized that HSF1 is regulated by one of two methods: by a feedback loop involving some of the heat shock proteins that HSF1 controls, or by coating the HSF1 protein with phosphate groups, which is called phosphorylation. Researchers in the lab of Whitehead Fellow David Pincus tackled the phosphorylation hypothesis by painstakingly mapping and eliminating the 73 phosphorylation sites on the budding yeast version of HSF1 and recording the effects. Even after the scientists simultaneously removed all of the sites, HSF1's function was only marginally affected. The team then turned to the feedback loop hypothesis. Using a two-step immunoprecipitation technique, the researchers determined that only one of the heat shock proteins, HSP70, interacts with HSF1. HSP70's relationship with the HSF1 protein reflects the heat shock factor's activity—when HSP70 binds to HSF1, HSF1 is turned off; and when HSP70 dissociates from HSF1, the regulator is turned on. 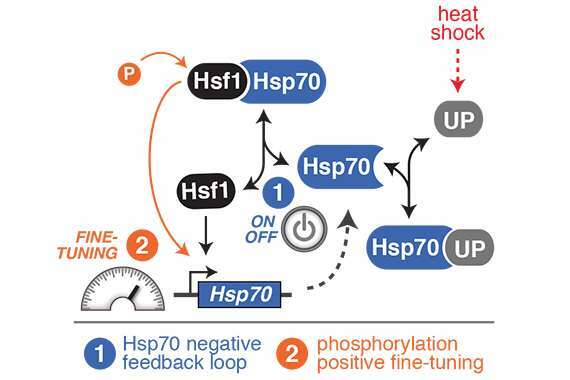 According to the lab's work in yeast experiencing heat stress, HSP70 is the primary regulator of HSF1 that acts as an on/off switch, and HSF1's phosphorylation acts as a positive fine-tuner to sustain the regulator's activity for a longer period of time. Although their model, which is described this week in the journal eLife, only accounts for one type stress in one organism, Joanna Krakowiak says that the team's research should be more broadly applicable. "Many things are about HSF1 are conserved from yeast to humans—it turns on the same chaperone genes and binds to the same piece of DNA in yeast and humans," says Krakowiak, a technician in the Pincus lab and co-author of the eLife paper. "If we find out how something is regulated or activated in one species, maybe we'll have at least some hint of what we can do to find out how it works in a different organism." "Phosphorylation may play a different role in human or other multiple cell organisms, and perhaps different cell types have different regulation signaling," says Zheng, co-author and postdoctoral researcher in the Pincus lab. "We were focused on heat stress in yeast, but maybe in starving stress or osmotic stress, other signaling also controls HSF1. There are still a lot of questions that need to be answered."